The title of this book is It’s Like This, Cat. 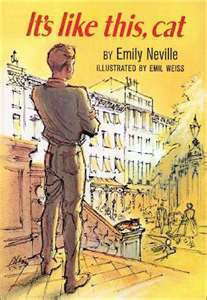 The author is Emily Neville. This book won the Newbery Award. It is fiction. The story begins in New York with the main character, Dave Mitchell, arguing with his dad. He gets in all sorts of arguments with his dad. He goes to an apartment where a lady named Kate lives. Everyone thinks Kate is crazy. She has lots of stray cats. Dave goes there every time he gets mad at his dad. This time Kate has a stay tomcat. They talk about his argument. She ends up giving him the tomcat. Dave names him Cat. Cat gets lost one week. Dave looks all around the block and finds him in the cellar of some building locked in a cage. A boy who was hiding in the cellar helps get the cat out. Dave tells his dad about the person in the cellar. His dad is a lawyer. The boy, Tom, ends up being a thief. They become friends, and Dave’s dad helps Tom. Dave goes to the beach one day with his friend, Nick, and Cat. They meet these girls and they take them to the movies later on. Dave becomes good friends with Mary, one of the girls he meets. Kate receives a telegram telling that her brother died and she got a lot of money that she didn’t want. She gives Dave two more cats. Two kittens. Dave and his dad finally stop fighting. And Tom comes to their apartment and says that he is entering the army. In the end, they have a toast of wine to Cat, who was in the middle of everything. I think the story was good but I don’t think that it should have gotten the Newbery award. ***Michelle’s commentary: This book explores the evolving relationship of young David Mitchell and his father. As his father goes out of his way to help Tom, who’s own father abandoned him, and Kate, who ends up in a legal mess after her she inherits her brother’s estate, Dave begins to see and understand what a good man his father really is. And Cat, of course, is at the center of all these relationships. I agree with Emily. Cute story, but not Newbery-worthy.